A 36-Year Hearing Aid Veteran tries LiNX 3D™ technology and it changed Her Life. If I couldn’t hear it, I didn’t miss it. That was my philosophy. Usually, when I would wake up in the mornings and put on my old high-powered BTE hearing aids (a set of ReSound LiNX2 9’s- that were formerly the best hearing aids I had ever used), I was oblivious to things outside my immediate area. I didn’t need to hear the cat meowing at me from another room, or the dogs barking at the trash pickup, or the music playing from the stereo in the living room. I can’t tell you how many times my coffee went cold because I didn’t hear it complete the cycle and walked out of the house without it. (Too many to count). I didn’t think I was missing much at work, because everyone knows my loss and they realize they need to face me, that they can’t call my name from another office and expect me to respond. I didn’t think I was missing out on the general chatter of friends in the central office, because I didn’t hear it happening. I had resolved that if I did not hear my name, it wasn’t my conversation to hear. A couple of months ago, I got the call from Hearing Aid Express about Beta-testing the new LiNX 3D hearing aid that ReSound was almost ready to unveil. I jumped at the chance! At the fitting, my licensed dispenser, Donovan Hickman, set up the L3D’s with my current digital program from my last pair of hearing aids and turned them on. My eyes grew very wide as the last beep signaled they were on. I sat there for a few seconds and asked him, “Did they just turn on the volume of the TV in the lobby, because I can hear it, and it seems loud.” Donovan was as happily surprised as I was. He hadn’t made any changes to the amplification or programming. Just turned it on with my current settings. While he was preparing to walk me through the updated Smart App® on my iPhone® and show me how to request adjustments through that App, he had to stop and make a call to his co-worker to clarify an app instruction. For the first time, in my life, I heard what the person on the other end of the phone was saying to Donovan. It was as if he was in the room with us. I was so excited! I couldn’t wait to get outside and see what happened next! Well, a lot happened. I heard my car making some squeaks that needed to be checked out (my breaks). The traffic was a lot louder than I expected and I had to turn the radio down quite a bit! At work, I heard conversations in other rooms, and I could respond to a question from across the hall! At home, I heard the birds outside in my backyard, my dogs playing a little rough with each other, and I discovered that my cat really likes to MEOW…a lot. 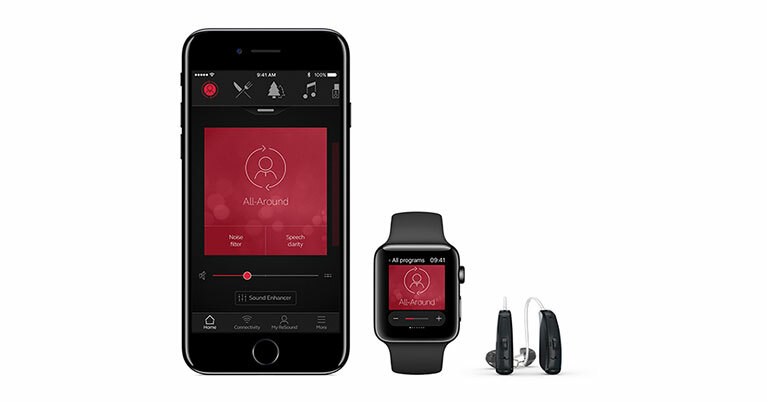 The most impressive thing about the ReSound LiNX 3D are the sound improvements. Never mind that I can request adjustments through the App on my phone to my dispenser and never leave the office or home! The really impressive thing about these is the amount of sound I am hearing and understanding! The noise filter on the app is equally phenomenal. No more echo in a room with no carpet…or annoying background chatter at the restaurant. I have all the settings put into the app and it switches to that program whenever I’m in that environment. Control is always at my fingertips. I was truly missing out on more than I realized. Its’ as if I was color-blind and the glasses gave the color back to me. Thank you ReSound and Hearing Aid Express. That first cup of coffee I was telling you about? It never gets cold anymore.